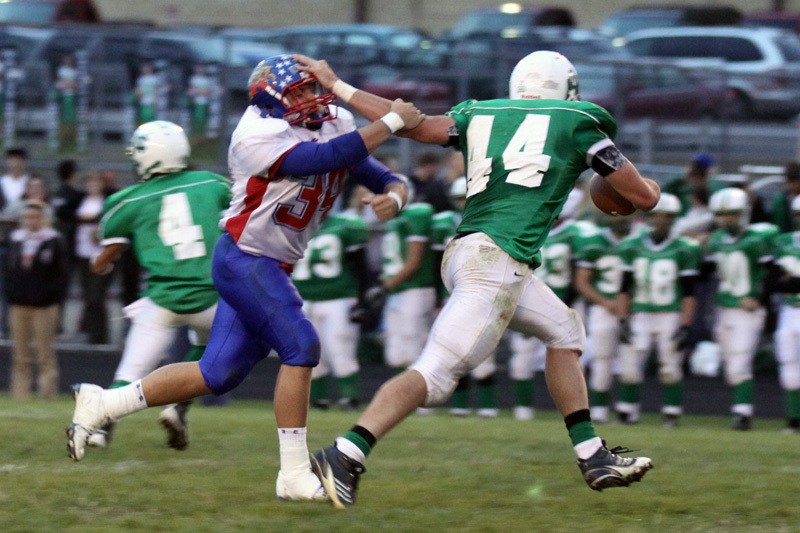 New Castle's Adam Kranda puts a stiff-arm on a Wildkat defender en route to a 200-yard rushing performance. Kranda will play at IU next season. NEW CASTLE – Kokomo Wildkat defense, meet Mr. Kranda. Despite a 0-2 start, much of which is attributed to the injury of record-setting running back Armon Bridgeforth, the Wildkat defense has held opponents in check through the first four games of 2011. But Friday night against New Castle – a team Kokomo had beaten in 31 consecutive outings – the Kat defense was exposed by the running of Indiana University recruit Adam Kranda. The outcome of the game was the same as it always is with Kokomo winning its 32nd consecutive North Central Conference game, 55-21, while breaking its school rushing record with a team total of 514 yards. But while the Kats have its sights on a fifth straight NCC crown, small cracks appeared in a defense that was giving up just 168.7 yards per game heading into New Castle (0-5). The Trojans carried the football 46 times for 303 yards, easily doubling the previous season high of 144 yards Kokomo (3-2 and 3-0 since the return of Bridgeforth) gave up in a 21-14 loss to Plainfield in week two. The 303 yards marked the first time a Colby-led Wildkat defense had given up more than 300 rushing yards. Huntington North rushed for 338 yards against Kokomo in 2006 – the year before Colby arrived in Kokomo. Kranda, a 6-foot-5, 240-pound senior, who has committed to play for new Hoosier coach Kevin Wilson, scorched the Kats for 200 yards on 21 carries – the highlight of which was a 75 yard blast over the right tackle, followed by an outburst of speed that put the Trojans in the end zone and on the board. He followed that with a third quarter 23-yard halfback pass for a second Trojan touchdown, then finished his evening with a 28-yard run up the gut of the Kat defense for his second rushing score. In all, Kranda accounted for 242 of the Trojans 367 yards of total offense. Colby said despite Kranda’s outstanding game and athletic ability, he was still disappointed in Kokomo’s effort on the defensive side of the football. Kokomo will have a full week of practice to regain its defensive dominance. After four straight road games, Kokomo returns to Walter Cross Field on Friday night for the first time since the opening night of high school football. The Kats host Richmond (2-3, 2-1) at 7 p.m. Before Hoosier fans will get a chance to see Kranda in action in Bloomington, he will finish his high school career in New Castle, starting with a visit from the Anderson Indians (3-2, 2-1) Friday night. This entry was posted in Football, Indiana University, Kevin Wilson, Kokomo, North Central Conference, Wildkats. Bookmark the permalink.